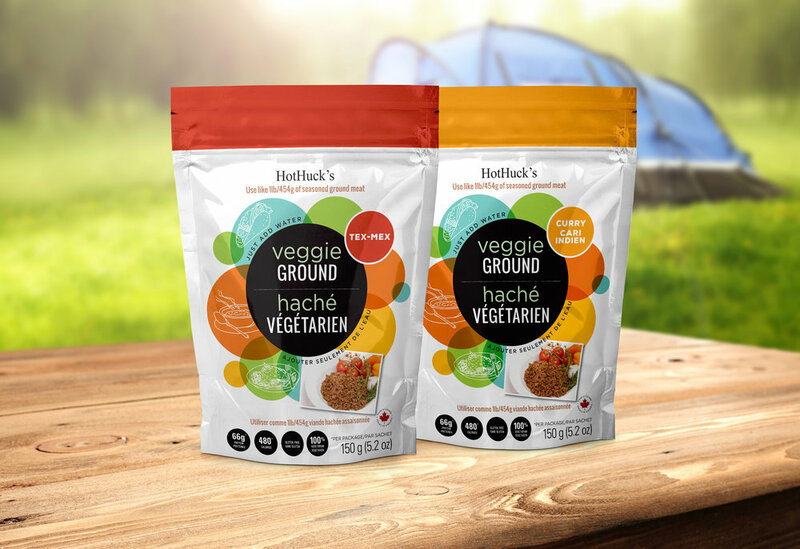 HotHuck's is a meatless veggie food product that comes in four flavours and is packed with protein. It's perfect for camping trips since it's light, doesn't require refrigeration and is loaded with protein. HotHuck's wanted to update its packaging with a new look that would make it feel more modern and would appeal to a wide variety of consumers beyond only outdoor enthusiasts. We excitedly took on the challenge of designing new printed pouches that are distinctive and stand out, while still communicating the versatility of HotHuck’s products. Along with creating their retail packaging, we also designed supporting materials for their food service sales, including labels, banners and sell sheets. HotHucks is currently sold at Mountain Equipment Co-operatives stores and online.